Is there something off with how reputation is built on Stack Exchange? Is reputation only built or assessed by tenure and quantity and not by fewer but well researched, studied and articulated questions and relevant answers? Original title started as this: Why does this off-topic member have higher rep than me & how can I report flag him to Moderators & Community? But now, I am just pointing at this as an example/ instance of the subject. 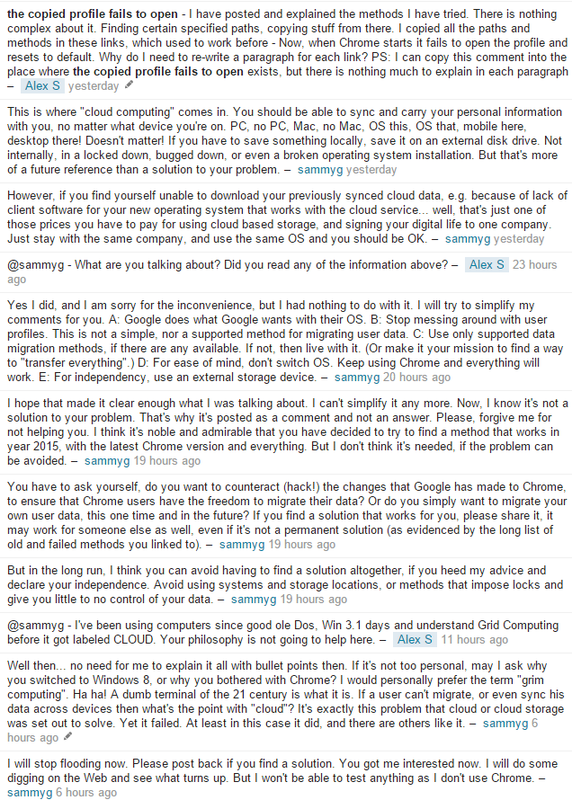 Please see sammyg's comments on my very valid and well researched question which received unnecessary and quite a few negative points. After an extremely off-topic flood of philosophical comment spam he says he has no idea as he does not use Chrome and has no idea what to do. I am trying to avoid bad mouthing and using bad naming/ bad words for such people, but what are we to do with such people? I have spent decades on technology & world exposure and dont post all the time on Stack Exchange sites; I do my research and putting together pieces from information and experience. I only ask questions here when I am unable to find a conclusive answer. But, I tend to get flagged, when (for lack of a better or more polite word) 'morons' ( I cant find a more polite word to use here.. if there is one please do clean this out) like this Run amok and build rep here. PS: I apologize for going this way, but how do I 'label' this member and his stupid & off-topic comment spamming? My piece of advice would be not to escalate this and call people names, or assume bad intentions. This user voiced their opinion and they're entitled to do so. I agree the comment thread got a little out of hand. Certainly, chat would've been a better option to discuss this—if there even is a need for discussion. ... 'label' this member and his stupid & off-topic comment spamming? I cleaned up the comment thread and I'd ask you to just flag these cases in the future, so that we can deal with it like we deal with all other cases of chatty comment threads. One of the things about any kind of troubleshooting is that it often requires a tangential approach to find out what the exact problem is, it could be with a component of something else. Sometimes it is useful to a user to say "have you thought about..." in order to garner whether the problem lies elsewhere. Due to the way the site works we have to allow users some way to talk to other users through comments. Usually those comments are useful and insightful but sometimes they appear to be idle chatter or unrelated comments, in those cases we have a tool called a "flag". You can use flags to tell a moderator that something doesn't belong here and it should be deleted. If you hover your mouse over a comment you will see a little flag button to the left of the comment, which you can use to tell us it should be deleted. That would have been the best way to handle this, a quick shrug, a flag and then done. Your question here though suggests that the entire system is flawed simply because one person has a higher number than you do, and that they might have fancied a chat. The "reputation" system is a measure of work, not respectability. Users have given their time to help other people with their problems and as a reward people say "this helped me" by upvoting it. Higher reputation users have invested a lot of of their own free time helping people for what amounts to nothing more than some fake internet points that say "this guy is helpful". Generally when someone comments or answers then they are trying, in some way, to still be helpful. The tone of your question here is belittling their efforts to help people they give to strangers for free. You should detach any notion of "this guy thinks he's better than me" that is connected to reputation and just deal with people as you find them. If they are confrontational then flag them for moderators to deal with. Flag their comments if they are pointless chatter. Above all else though, treat other community members with the respect you would have them treat you with. Calling someone "stupid" just because you don't think they are being helpful is entirely disrespectful. Would you be happy with someone calling you that if you happened to misread something and sidestep a conversation slightly? There is a Flag capability for comments. The flag shows up when you place your curser to the top left of the comment text. For the most part everyone here is trying to help, even if they have different methods, different ideas, and different thinking. Sammyg acquired rep from participating here quite a bit. I am not a mod (at all) but mods have cleaned up some of the bad rude or really unnecessary comments before. 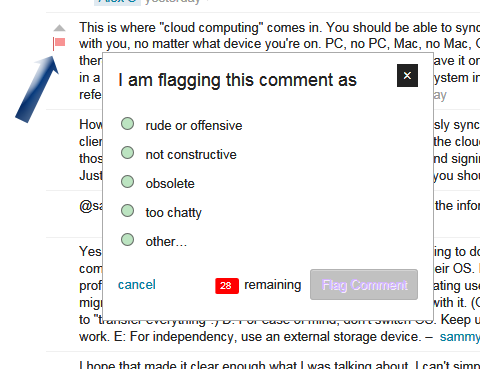 I would choose "too chatty" , and I doubt anyone would have a big issue with a comments cleanup there. Generally people on here are trying to help. It is a community. 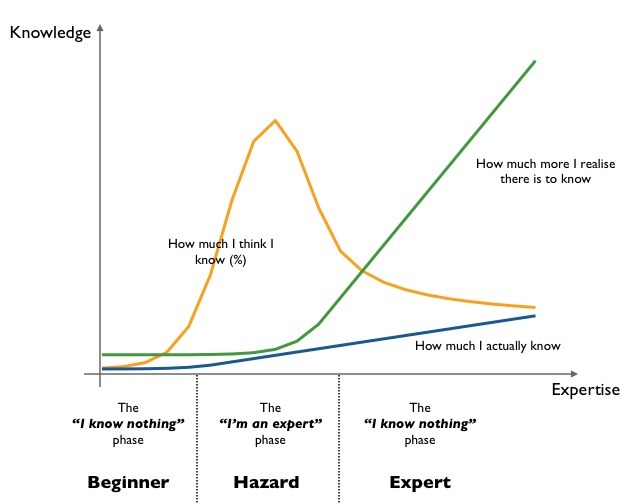 So someone has a bigger number than you, been on here longer, know less, knows more - does it really matter? Your decades of experience should have taught you to be humble and accept that not all people operate at the same level in your specific domain. However, some of my best discoveries have been through people with less experience than me helping me to think of old methods and problems in new ways. When you come up with a workable method of reputation that can be applied historically we will be all very interested to hear. Not the answer you're looking for? Browse other questions tagged support comments moderation spam moderators . How to have a newline when commenting in stack exchange? Is there something wrong with my question regarding Outlook?